ForeFlight 11.2 is available now with a brand new “Passenger” companion app, as well as new features like route line in Profile view, airspace hiding by altitude, 3D View anywhere, and more! Available on the App Store now, Passenger is free to download and requires no setup. Your travel companions will be able to view the route of flight overlaid on the map, real-time aircraft position, speed, altitude, estimated time of arrival, and more – right on their own iPad or iPhone. Connectivity between ForeFlight Mobile and Passenger is available for all ForeFlight subscribers. To wirelessly share your route with nearby devices running Passenger, tap into More > Passenger in the ForeFlight Mobile app, then tap Enable & Start. Both devices should have Wi-Fi enabled for the connection to work. If you make changes to the route, ForeFlight will automatically transmit them to Passenger. Passengers can pan and zoom around the map without affecting anything in your ForeFlight Mobile app. Passenger supports Split View and Slide Over on iPad so users can multitask while staying up to date with flight information. Be sure to let your friends and family know about Passenger before they join you on your next flight! Learn more at foreflight.com/passenger. 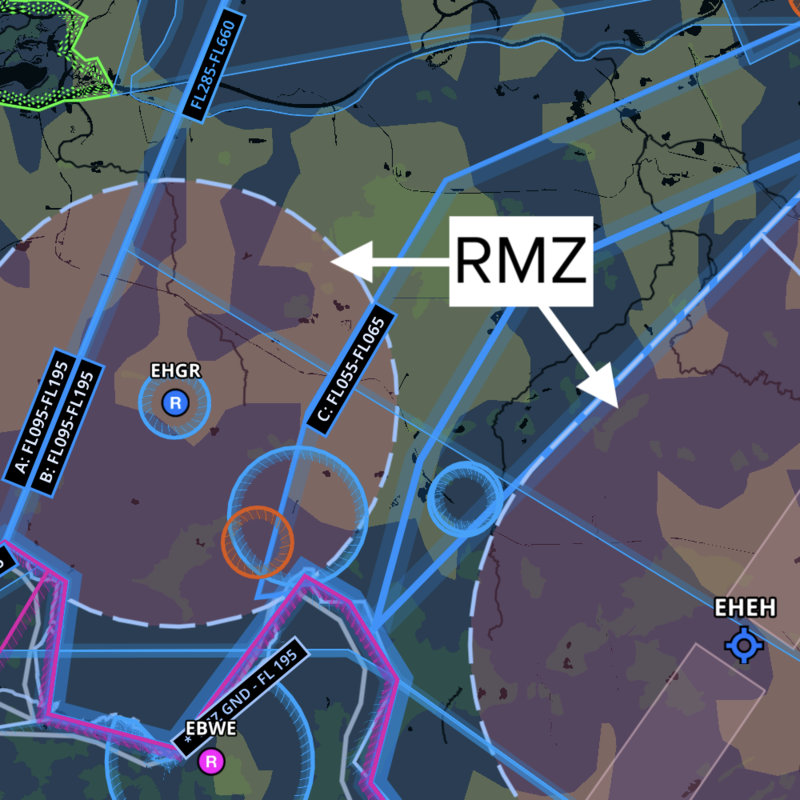 Profile View now offers a side-on perspective of your route line and inflight progress in relation to terrain, obstacles, and airspace, supplementing the top-down map view and improving your situational awareness. In the Flight Plan Editor on the Maps view, select an aircraft, create a route, then tap Profile near the bottom-right corner. Profile View shows your planned route line in relation to terrain, obstacles, and airspace. ForeFlight uses your aircraft’s performance data to depict realistic climb and descent profiles, including top of climb and top of descent points. The detailed ForeFlight Performance Profiles that are available with the Performance Plus plan will give the most accurate depiction, but ForeFlight will also use basic performance profiles to show climb and descent. You can zoom and pan left and right in the Profile View to get a closer look at any part of the route. After takeoff, Profile View automatically switches to an inflight mode that shows your current altitude and the terrain, obstacles, and airspace up to 65 nautical miles ahead of your current position. Tap the route icon in the top right to switch back to the plan view. If you are within the route corridor, the plan view will display your current position and altitude in relation to your planned route. Profile View is included in ForeFlight Pro plans and above and you can learn more about ForeFlight’s mobile hazard awareness technology at foreflight.com/hazard. Declutter ForeFlight’s Aeronautical Map by hiding airspace above a selected altitude, making it easier to focus on airspace more relevant to your route. You can find the “Hide Airspace Above” option in Map Settings > Airspace, and enter altitudes in either feet or flight level (e.g. 18,000 or 180). Erasing the value will turn off the setting and show all airspace. A small banner appears in the bottom-right corner of the map if airspace is hidden to keep you aware of the current setting, and if you climb to within 1,000 feet of hidden airspace along your route, ForeFlight will automatically reveal it, helping you stay aware of airspace when you need to be. Access 3D View for any location on Earth, not just airports. 3D View combines high-resolution terrain and aerial imagery to create a realistic representation of wherever you tap and allows you to zoom and rotate the map in three dimensions. To see 3D View, tap-hold a spot on the map, then tap the “3D” button in the top right of the Add to Route window. Use 3D View anywhere to get a better sense of what terrain and obstacles will look like on your route so you’re more prepared for your next flight. When you send a flight plan that has block times entered in the Flight Log to Logbook, those block times are now carried over and appear in the new Logbook entry. These times are similarly preserved when you send a recorded track log to Logbook, including when a draft Logbook entry is created automatically from a new Track Log. Learn more about Logbook here. Gogo’s ATG and AVANCE lines of inflight Wi-Fi systems can now provide GPS position and indicated altitude in ForeFlight. Optionally limit expensive data usage over Gogo’s network by disabling ForeFlight’s internet-connected capabilities like streamed weather data. Along with Satcom Direct Router support, Gogo support is available with Performance Plus and Business Performance subscriptions. See what other connectivity options ForeFlight supports here. This release brings new AIP charts and data for Italy, Croatia, and Slovenia, including IFR high and low enroute charts, IFR and VFR procedure charts, airport diagrams, VFR ICAO charts for Italy, and AIP documents. Jeppesen’s IFR and VFR aeronautical data is also included for all three countries. We also have new optional VFR add-ons available, including the Avioportolano VFR Chart and Flight Guide for Italy, DFS VFR 500 Charts for Italy and Croatia, the Slovenian Rogers Data VFR Trip Kit and 1:200k Chart, and the Air Million VFR 1:1,000,000 Chart combo which covers Western, Central, Southern, and some of Eastern Europe, as well as the Azores, Madeira, and the Canary Islands. Visit foreflight.com/europe to learn more about what features European pilots can benefit from, and see all available charts and data with prices here. One of the great benefits of our data-driven Aeronautical Map layer is that we can make significant updates and improvements to it without needing a whole new app release. Instead, we can just issue updates as part of our regular data-cycle releases, and the changes become visible after you download the new “Airport & Nav Database” at the top of the Downloads list. 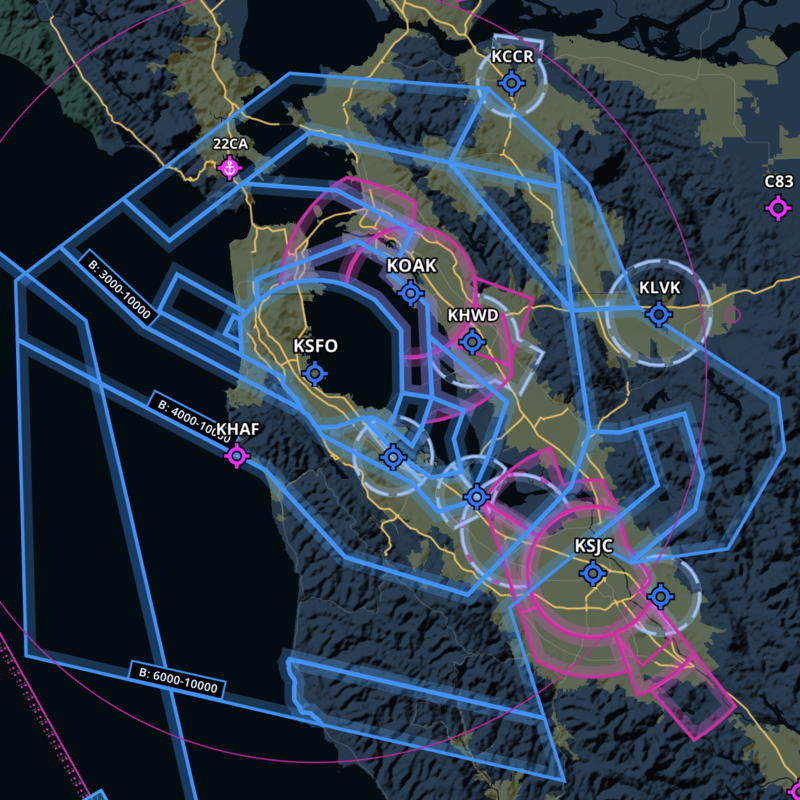 Over the past couple months we’ve made a number of major enhancements to the Aeronautical Map this way, so read on to learn about what those are and where you can find them. One of the most prominent recent changes to the Aeronautical Map is that airway labels are now more prominent, and look similar to what you’d findon an IFR enroute chart. And like on an enroute chart, black and white labels indicate traditional, VOR airways, while blue and white labels indicate RNAV airways. One other improvement that pilots flying in Europe will appreciate: the Aeronautical Map now depicts directional airways using arrow-shaped labels. Bay Area pilots are probably already familiar with the new Class B airspace structure enveloping KSFO. Even a massive change like this is very simple to make with the Aeronautical Map – we released an update to the Airport & Nav Database containing the new airspace structure about a week before it become effective. When the data-cycle turnover happened at 0901 UTC, August 16, 2018, ForeFlight swapped out the old database for the new one and updated the map instantly. Most of the other recent updates we’ve made to the Aeronautical Map have been directly in response to feedback from our new customers in Europe. Europe has many types of airspace, airways, and VFR navigation features that are rare or nonexistent in North America, so we had to find new ways to depict all of this information to ensure that the Aeronautical Map would be useful to all of our customers. Control Zones (CTR), Radio Mandatory Zones (RMZ), different types of civilian Traffic Zones (ATZ/TIZ/TIA), and Military Aerodrome Traffic Zones (MATZ) were formerly depicted using a single style. Now there are four separate styles to help differentiate these airspaces. As with most of the features on the Aeronautical Map, we incorporated elements from ICAO charts when designing these styles so they would be familiar to pilots, while also ensuring that they fit within the Aeronautical Map’s overall design style. 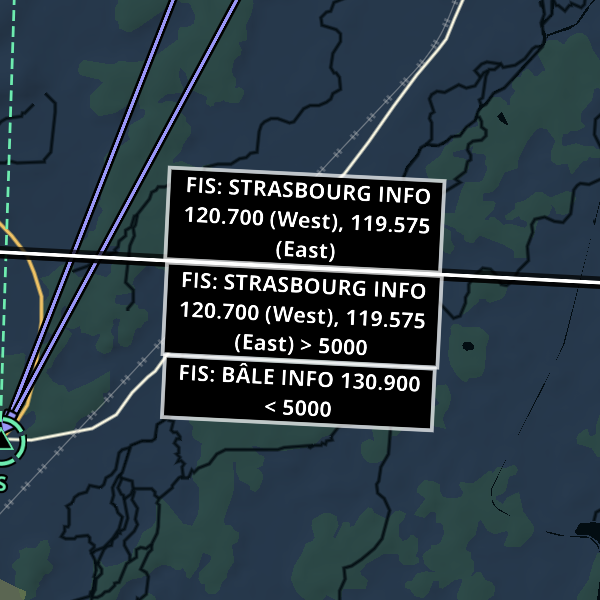 To make finding the right frequencies easier for pilots in Europe, we added prominent labels to all FIS boundaries providing the name and information frequency of each coverage area. You can find other frequencies by tap-holding on the map and tapping Details > Communication Details for the relevant airspace, or by tapping on an airport marker to access the frequency list, which often includes frequencies for the surrounding airspace. 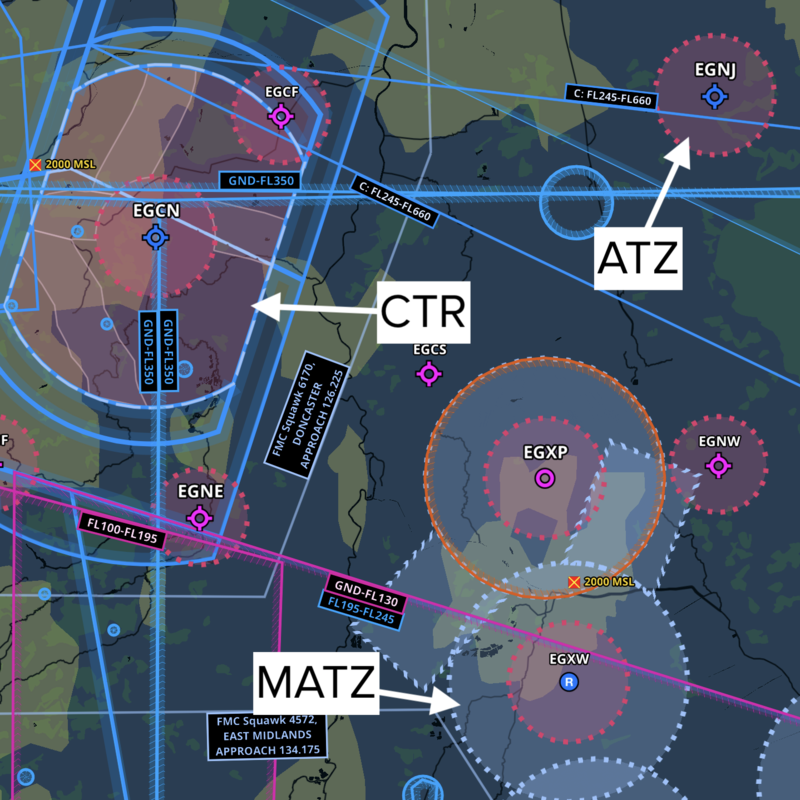 All ForeFlight subscriptions that include the Europe region come with Jeppesen’s high-quality VFR navigation and airport data built directly into the Aeronautical Map, providing a valuable resource for VFR pilots across most of Europe. We’ve also recently made some styling changes to this VFR data, exposing data that wasn’t depicted before and improving the styling of existing data to provide more information at a glance. Conveniently, the screenshot below illustrates all of these changes. In the bottom-right you can see a VFR Transit Route, which ATC uses to direct pilots through Controlled Airspace to minimize separation issues with IFR traffic. VFR Transit Routes have labels conveying important information about the route, including the type of transit route (Helicopter in this case, but other types are VFR and Military), the route’s altitude boundaries, the distance of each route leg (8nm), and the magnetic bearing in one or both directions. We styled VFR Transit Routes on the Aeronautical Map to match the color of VFR Waypoints so it’s easier to differentiate them from airspace boundaries and other route types. Intersecting the Helicopter route in the screenshot and extending to the north of the airport are VFR Flight Corridors. These provide safe corridors for VFR traffic on approach and departure, and include labels indicating each corridor’s name and minimum altitude. The Aeronautical Map also displays IFR Flight Corridors, which can help VFR pilots avoid IFR traffic. Lastly, the airport in the screenshot has two kinds of traffic circuits – a standard non-directional circuit in solid white, and the newly supported directional traffic circuit made up of white arrows. Both circuits show the traffic pattern altitude of 2,700 feet. Get familiar with these changes to the Aeronautical Map so you can maximize your use of ForeFlight for planning and flying, and look forward to additional updates in the future. If you have any feedback or suggestions on how to make the Aeronautical Map, and ForeFlight in general, better suited to where and how you fly, feel free to email them to team@foreflight.com – we’re all ears. ForeFlight develops the essential, powerful, and popular integrated flight application for VFR and IFR pilots that delivers the data, information, and capabilities needed to quickly and safely plan, fly, and log flights. FRIEDRICHSHAFEN, DE | April 18, 2018: ForeFlight announced that it will introduce its flagship integrated flight application in Europe this summer. ForeFlight Mobile, which will be on display for demonstration at AERO Friedrichshafen (stand A3-504), is the most widely used application by individual pilots and professional flight crews to efficiently access weather, airport information, plan flights with optimized routing, file flight plans via EUROCONTROL, access and manage electronic charts and maps, reference flight manuals and documents, avoid terrain and obstacles with state-of-the-art hazard awareness tools, access in-flight weather where supported, and aid enroute navigation. Plan, brief, and file with ForeFlight on mobile and the web. Additional product images below. ForeFlight will offer European pilots — beginning with a focus in the German market — a single solution for VFR and IFR flying. All subscription plans for the Europe region will include Jeppesen’s best-in-class digital VFR and IFR navigation data, which are dynamically rendered directly on ForeFlight’s fast data-driven aeronautical map, as well as AIP procedures, charts, and documents provided via EUROCONTROL. Optional purchases will include Jeppesen VFR terminal procedures (formerly Bottlang charts), Jeppesen IFR global chart coverages (available today), and host nation VFR data packages – initially with an option to add charts and procedures from DFS. AERO attendees are encouraged to visit the ForeFlight stand (A3 – 504) for a demonstration and to sign up to be notified about ForeFlight’s European release. You can learn more about ForeFlight Mobile as well as sign up for notifications by visiting foreflight.com/europe. ForeFlight’s powerful, state-of-the-art map engine gives the app its signature speed and fluidity when panning and zooming. The global basemap and data-driven Aeronautical Map layer feature Jeppesen’s high-quality terrain, obstacle, and NavData®. In addition, Jeppesen’s Europe VFR data is integrated into the Aeronautical Map, giving VFR pilots all of the information they need to fly, including VFR waypoints, arrival and departure procedures, circuits, holds, no overfly areas, nature reserves, and more. For IFR flyers, optional Jeppesen chart coverages are available today and include departure, arrival, and geo-referenced terminal procedures, airport charts, data-driven enroute charts, and Jeppesen Airway Manual supplements. ForeFlight makes preflight planning fast and easy. Customers can plan a route in minutes using ForeFlight’s interactive Map or the form-based Flights view. The Graphical Route Advisor feature produces EUROCONTROL validated routes within a matter of seconds and presents the options for comparison on a visual preview map. For customers on the top-tier Performance Plus plan, ForeFlight also provides a Recommended Route option that produces the best route based on wind, temperature, and the specific aircraft performance profile. In addition, planning for and navigating through the complex airspace in Europe is easier with ForeFlight’s new Airspace in Profile and Automatic Airspace Highlight capabilities. In the app’s Profile View, a vertical cross-section of the planned route is depicted with airspaces, terrain, and obstacles. The view is interactive so tapping on an element in the Profile simultaneously highlights the location of that element on the map below. Inflight, Profile View depicts the aircraft’s current altitude in relation to airspace, terrain, and obstacles along the flight track. The Automatic Airspace Highlight feature considers the flight’s climb, cruise, and descent trajectory to highlight airspace near the aircraft or along the route of flight. All other airspace dims to reduce airspace clutter on the map. This feature works in both preflight planning mode and in flight. Customers can file flight plans directly from the mobile app or on the web. ForeFlight’s global, redundant AFTN connection provides fast, direct, and unlimited access to filing flight plans with EUROCONTROL with no additional cost or account configuration required. 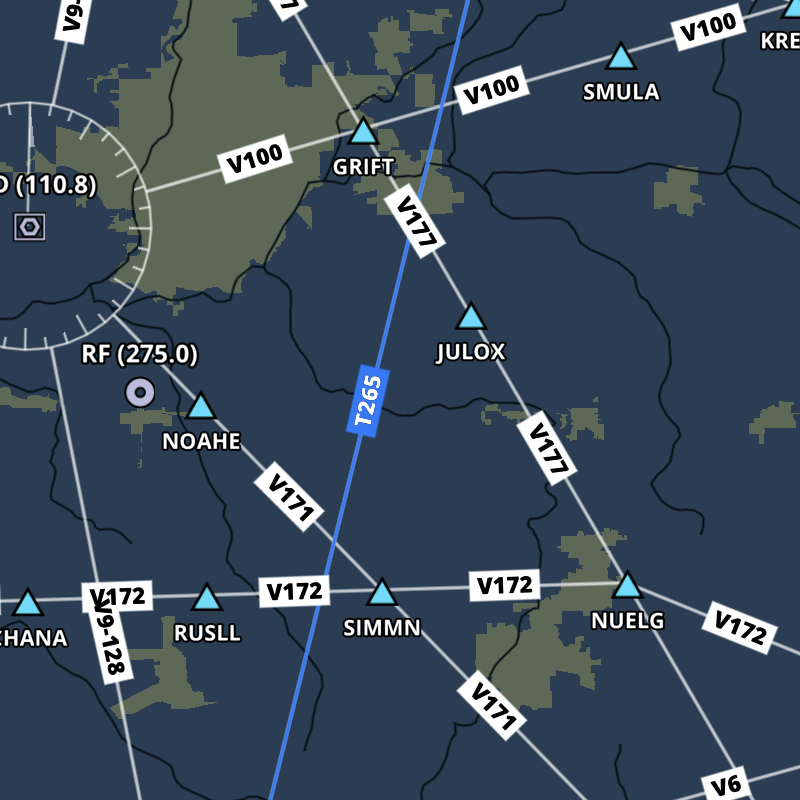 Routes from the Graphical Route Advisor can be filtered based on IFR, VFR, YFR, or ZFR flight rules making it easier to find the correct route and to select it for filing. The planned route line can be viewed in relation to a full range of interactive aviation weather layers, including animated radar, global satellite and winds aloft, color-coded METARs and TAFs, graphical AIR/SIGMETs, global icing and turbulence, surface pressure isobars, and more. A separate Imagery view neatly organizes static weather forecast imagery by region. Once in the cockpit, the Maps tab transitions from comprehensive preflight planning tool to dynamic inflight navigation support. 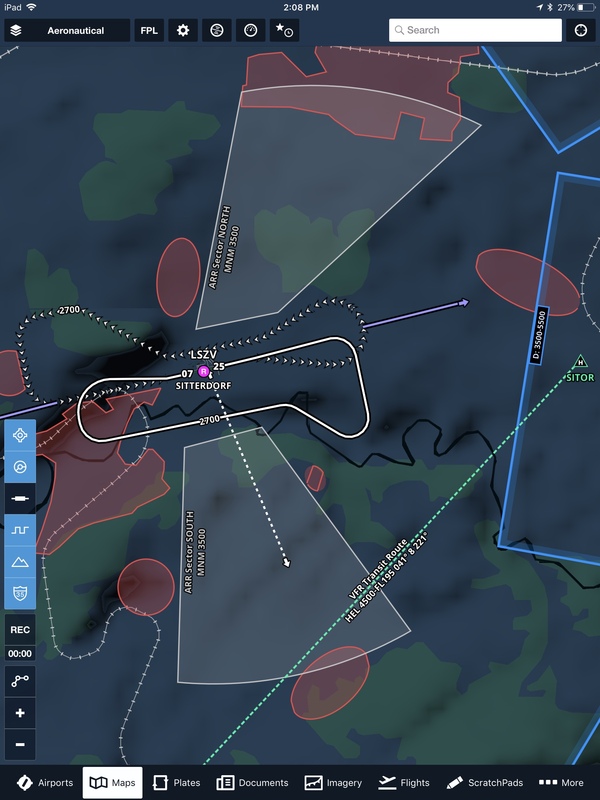 For the ultimate situational awareness, the innovative Charts on Maps feature overlays approach plates and airport diagrams onto the moving map, along with aircraft position, weather, and hazards in one integrated view. ForeFlight’s advanced, global hazard awareness technology helps pilots plan and fly with more confidence in all conditions and terrain. The top-down-view Hazard Advisor map layer, the side Profile View, and 3D Synthetic Vision depict a clear picture of terrain and obstacle hazards anywhere in the world. When paired with a compatible AHRS source, Synthetic Vision provides a backup attitude display. In addition to AHRS, ForeFlight’s Connect platform enables portable and installed avionics to connect with ForeFlight Mobile and deliver capabilities like two-way flight plan transfer, and the display of ADS-B traffic and GPS data. Learn more about ForeFlight Connect at foreflight.com/connect. ForeFlight offers three plan levels for individuals: Basic Plus, Pro Plus, and Performance Plus. For as little as €106.99 (including VAT) per year, ForeFlight’s Basic Plus plan gives VFR pilots in Europe all the data they need to plan, file, and fly. The Basic Plus plan (€106.99 including VAT per year) includes Jeppesen VFR and IFR navigation data, Jeppesen global airspace information, AIP charts and documents provided via EUROCONTROL, data-driven Aeronautical Maps, flight planning and filing on mobile and web, graphical preflight briefing, aviation weather, FBO directory, avionics connectivity, built-in documents catalog, Weight & Balance, Checklist, and more. The Pro Plus plan (€213.99 including VAT per year) includes everything in the Basic Plus plan, plus geo-referenced approach and taxi charts, Charts on Maps, Profile View with Airspace, Terrain, and Obstacles, and Synthetic Vision. The Performance Plus plan (€320.99 including VAT per year) includes everything in the Pro Plus plan, plus access to a powerful suite of advanced planning features, including a built-in library of detailed aircraft performance profiles that produce the most accurate flight time and fuel burn calculations, a sophisticated flight planning engine that generates optimized routes between any two airports in the world, fuel and payload planning, automatic fuel and weight safety checks, integrated contract jet fuel pricing, and more. All plans include one geo-region: Europe, US, or Canada. Additional geo-regions can be added for €100 (including VAT) per year. Pricing for Jeppesen IFR chart coverages can be viewed online at foreflight.com/jeppesen. Jeppesen VFR Procedures (formerly known as Bottlang Charts) can be purchased for one country for €49 (including VAT) per year, or all Europe for €99 (including VAT) per year. The National package for Germany from DFS with VFR AIP and charts can be purchased as an add-on for €105 (including VAT). The VFR AIP alone can be purchased for €60 (including VAT). The DFS VFR charts can be purchased separately for €54 (including VAT). ForeFlight is exhibiting at the 2018 AeroFriedrichshafen Global Show for General Aviation April 18-21 (stand A3-504) and the European Business Aviation Convention & Exhibition (EBACE) May 29-31. Click on images to view full screen; right-click to ‘save as’/download. ForeFlight moving map view with Airspace in Profile View. ForeFlight on iPad and iPhone with Jeppesen approach chart on the map. ForeFlight moving map with Jeppesen VFR navigation data and glide advisor. ForeFlight with splitscreen Synthetic Vision and Jeppesen chart. ForeFlight map with Jeppesen chart and radar. ForeFlight airport-runway closure NOTAM warning. ForeFlight moving map with DFS VFR chart. ForeFlight map with Jeppesen VFR approach procedure. ForeFlight with Profile View and planned route on the map. ForeFlight was founded in 2007 by software developers and aviation entrepreneurs – inspired by the introduction of the Apple iPhone – to develop elegant, high-performing integrated flight applications for pilots. ForeFlight is a four-time recipient of the Flying Magazine Editor’s Choice award and has become the leading application for individual pilots and professional crews in personal, business, and military aviation. Through our partnership with Jeppesen, ForeFlight is building the next generation of integrated flight applications for the commercial aviation market. In addition, the company’s Fast and Friendly Pilot Support™ Team delivers amazingly fast and friendly customer service. Learn more at foreflight.com.